The idea for this association was brought up as a result of a problematic SAR mission; Evacuation of the crew from Herakles-Bulk in 2004. One Finnish rescue swimmer and the captain of the distressed ship were forced to be left in mercy of the raging sea in result of a broken winch cable in the Finnish rescue helicopter. Fortunately a Swedish helicopter crew was also arriving the scene. The Swedes lowered down their swimmer and here the two rescue swimmers meet, unknown to each other, in the middle of darkness and surrounded with the angry Baltic Sea. The first rescue swimmers meeting was held in Finland and Estonia, 2009. The idea of establishing an association for rescue swimmers finally came alive on a ferry between Estonia and Finland during the first meeting. It was clear that there was a demand for a forum where we could share our experiences, learn from each other and meet colleagues who are also hanging in an aircraft with rotating blades. "Nobody gets left behind." - Brothers with fins. 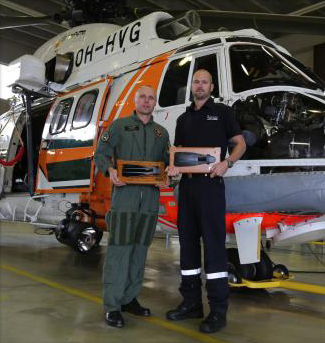 Rescue Swimmers Risto Leino (FIN) and Daniel Ericson (SWE) received the EuroRSA Rescue Swimmer Award for their effort in the Herakles Bulk rescue.